Baptist Memorial Hospital is a 6 level, 467,000 SF state-of-the-art medical facility. Located within the historic city of Oxford, MS., the completed development will house over 217 beds along with an ambulance facility and will replace the existing medical facility. Harcon is responsible for the concrete construction of the foundations, columns, walls and elevated floor slabs. 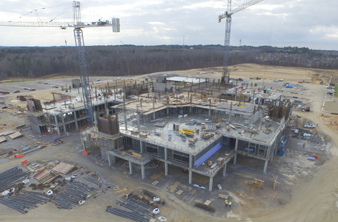 By utilizing a quick erection formwork system, Harcon has been able to frame and deck the high story heights and complex framing system at sufficient rates to achieve and exceed the aggressive productivity targets. The facility is on schedule to open April of 2017.